Casino Heroes is an online casino brand belonging to Casino Heroes Limited, which is licensed to offer online casino gaming services by the Lotteries and Gaming Authority (LGA) of Malta. 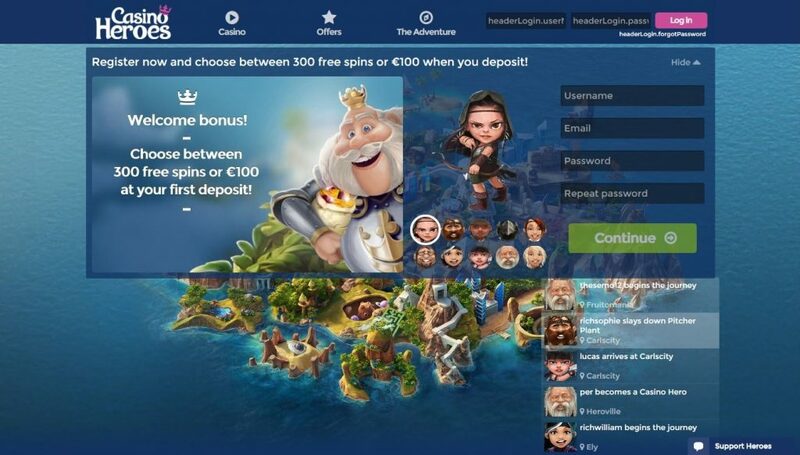 Casino Heroes is the brainchild of a team of Scandinavian gaming experts and enthusiasts who wanted to deliver a unique gaming experience. Casino Heroes welcomes you to Hero Island where a generous King rules the land. Everyone on the island used to live in perfect harmony, surrounded by untold riches that you can’t even begin to imagine. However, something went horribly wrong where evil bosses managed to get their hands on the riches and sent the island into a panic. Your quest is to register a new account to assist the King in taking it all back. Casino Heroes is an action-packed adventure casino where you choose an avatar to be your hero and explore the island to face several challenges. Every challenge that you complete will be awarded with amazing prizes. The adventure at Casino Heroes is straight forward. It all begins with Treasure Island where a fearsome dragon called Betser stole the King’s crown and hid it within Treasure mountain. To ensure it guarded well, Betser placed evil bosses in every region of Treasure Island. Your quest is to explore every region, battle against 40 different bosses and take back the stolen crown from Betser. Every spin made on your favorite games will be tracked on the progress bar, also indicating your next boss fight once the progress bar is full. You will need to challenge each boss in each region, and if you manage to beat the boss, you will continue to the next region. With every boss fight and adventure throughout the island, you will be awarded loot that consists of rubies. You will be able to exchange rubies at the Ruby store for different variations of spins to continue your battle through Treasure Island. The Casino Heroes website is extremely user-friendly and easy to navigate. The site content is displayed over Treasure Island where all the action is taking place to defeat the fearsome dragon. The layout is simplistic and features four main categories including Casino, Offers, The Adventure and Feast of Treats displayed at the top of the website. The Casino category gives you a simple and effective breakdown of all the different types of games the casino has on offer. You will be able to navigate between slots, roulette, blackjack, video poker, table games and live casino at the top of the web page. You can also sort them by popularity, newest game releases and alphabetically. Furthermore, you can filter them by low bets, high bets, jackpot games, bonus rounds and free spin games to find exactly what you are looking for without having to do too much leg work. The “Offers” category gives you a fantastic breakdown on what you will be able to claim based on the deposit amount you wish to make. The higher the deposit amount, the greater the offer will be. You can also find the available payment methods on this page and decline the welcome match offer if you don’t wish to claim one. The Adventure category basically gives you a detailed description of Treasure Island and what exactly needs to be done to rectify the dragon problem while the Feast of Treats category is an advent calendar that is updated monthly with exciting and generous rewards. So, make sure to have a look at it daily once you registered to ensure you don’t miss out on any promotions. Casino Heroes is home to a unique new player bonus. Players can deposit anywhere in the range of €20 to €200 to claim free spins on featured online slots. If players deposit between €100 to €200, they will receive 250 free spins on five slots games or 175 free spins on four slots games, respectively. Deposit €20 to €50 and receive 120 free spins on three slots games or 60 free spins on two slots games, respectively. If you opt to deposit the minimum of €10, 25 free spins on one slot game will be awarded. However, this bonus offer is associated with several terms and conditions and players need to read and understand them before claiming the bonus. At Casino Heroes, gambling is an adventurous journey. As previously mentioned, all registered players become residents of the Heroes Islands. They should play their favorite casino games and move from region to region, where they will come across bosses. They should defeat the bosses to be able to receive rewards and continue on their journey. Each player’s goal is to reach Mount Treasure and get the Golden Crown. The online casino rewards real money players with XP Points. Players can also earn XP Points for logging into their online casinos every day. XP Points help casino players defeat bosses, win rewards, and journey towards the Golden Crown. Choosing games at Casino Heroes has never been easier, featuring a clear interface that is suitable for both advanced players and beginners. The interface also includes a range of filtering and search possibilities. The casino provides a unique list of amazing games including video slots, blackjack, roulette, video poker games and even table games. The video slots at Casino Heroes are renditions from both Betsoft and NetEnt, two very prestigious software developer companies. Your journey on Treasure Island begins in a place called Heroes Ville where you can enjoy several different video slots including Magic Portals, Twin Spin, After Night Falls, Dead or Alive and much more. There are over 20 different table games offered by Casino Heroes to ensure there’s something for everyone who decides to register with them. Table games include Craps, Caribbean Stud, Casino Hold’em, Blackjack, Roulette and Red Dog. Casino Heroes also has an excellent video poker section with games like Deuces Wild, Jacks or Better and Bonus Poker. The live casino featured at Casino Heroes is powered by Evolution. Evolution is the world’s best live casino provider, so you can only imagine the fun and excitement that awaits you in the live casino section of Casino Heroes. The live casino has something for everyone ranging from Party tables to Platinum VIP tables spread across Blackjack, Roulette, and Baccarat. The mobile app from Casino Heroes is offered at the App Store and can be easily downloaded on your smartphone. The casino mobile app is supported on certain systems including Android, iOS, Blackberry and Windows Phones. The mobile app from Casino Heroes is designed to give you the impression that you are in a Las Vegas Casino with numerous different games popping up all over the place when you downloaded the app. You will also be able to play a selection of games that won’t require any deposits at first so you can test the casino and its games before making your initial deposit with the casino. Casino Heroes might be a fresh new face in the online casino industry, but since their inception in 2014, they have been nominated twice for the prestigious EGR Rising Star Award. That alone should tell you that the company is doing something special and unique for their players and it’s only a matter of time before they receive several awards for their efforts as an online casino. Casino Heroes might be available on your desktop and mobile devices, but unfortunately, not all countries will be able to experience the thrill and excitement this casino brings to the table. Countries that will no be able to play at Casino Heroes include the United States, Bosnia, and Herzegovina, United Kingdom, China, Reunion, France, Russia, Malaysia, Guyana, and Italy. Casino Heroes has a live chat support system that is available 247. Players with queries can get in touch with a customer support agent any time they wish. They can also check out the comprehensive Frequently Asked Questions (FAQ) section for information. Players can also write to Casino Heroes Limited, Central Business Centre, Madina Road, Zebbug, ZBG9015, Malta. There are plenty of reasons to play at Casino Heroes, and the advantages continue to grow. The casino software can be played in instant mode, eliminating the tedious download process, so many other casinos demand you to do. Your personal and financial data is kept safe and secure with SSL encryption technology used by the casino, and the software is tested and proven fair. The only disadvantages include a three-day waiting period on your withdrawals and the fact that the live chat facility is not available around the clock. Casino Heroes is the best online casino for players looking for a unique and rewarding casino gaming experience. The casino offers magnificent games powered by NetEnt and Betsoft while giving you a wide range of thrilling games from video slots through to an assortment of table games. The software operates smoothly and provides high-quality graphics and state-of-the-art designs to keep you intrigued.